One of the key aims of the Network is improve the performance and enjoyment of our members through coaching. Each club has appointed a coaching/run leader coordinator to act as a point of contact and to promote athlete development. Coordinators meet regularly to plan coaching sessions and to share knowledge. Since its inception, the Network has tried to foster a culture of improvement and has worked to get more qualified coaches and leaders into running clubs; particularly those with no history of organised coaching. 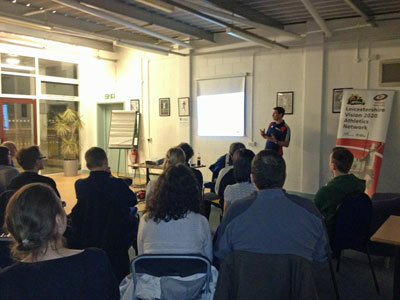 We have also launched a ‘coaches club‘ to provide support and development opportunities to coaches and leaders. This initiative complements governing body work like Movement Skills Workshops and Regional Technical Days. The Network organises ‘Flying Coach’ sessions when an expert from outside of the county comes to do a session with athletes and coaches. Coaches have included the late Dave Sunderland (National Coach Mentor and renowned Middle Distance coach), Dr Kevin Currell (EIS Nutritionist) and Rob Thickpenny (National Coach Mentor for Physical Preparation). These are complimented by ‘Club Sharing’ sessions in which local coaches lead running drills and demonstrate other training techniques.